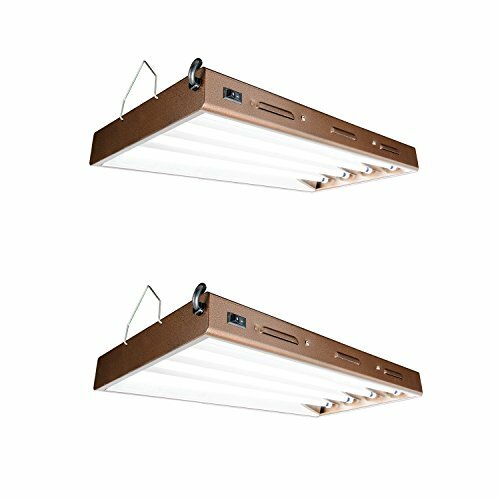 Give your plants the spotlight they deserve and watch them thrive under this Agrobrite Designer T5 96W 2' 4-Tube Grow Light Fixture. The magic happens underneath the 4 included fluorescent T5 tubes. They beam with 96 watts, 6400 Kelvins, and 0.8 amps. The 2 toggle switches give power to lamps and the powder-coated steel housing can handle hanging overhead or vertically. Grow what you know and make it happen with performance, flexibility, and high lumen output thanks to this Agrobrite Designer T5 96W 2' 4-Tube Grow Light Fixture. If you have any questions about this product by AgroBrite, contact us by completing and submitting the form below. If you are looking for a specif part number, please include it with your message.